Lighthouse Beer & Wine is a bottle shop located in Wrightsville Beach, NC. From domestic beer to high-end wine and everything in between, you are guaranteed to satisfy those taste buds with Lighthouse’s incredible selection. This family-owned shop is actively involved in Wilmington and continues to thrive in this beachside community. Every October, Lighthouse Beer & Wine puts on a wonderful event called The Beer & Wine Festival. The 16th annual festival will take place this year on October 29th from 1pm-5pm. Sage Island has been partnering with Lighthouse Beer & Wine for many years to help promote and advertise this awesome event though a custom designed graphic, which is displayed throughout the city on posters as well as online. 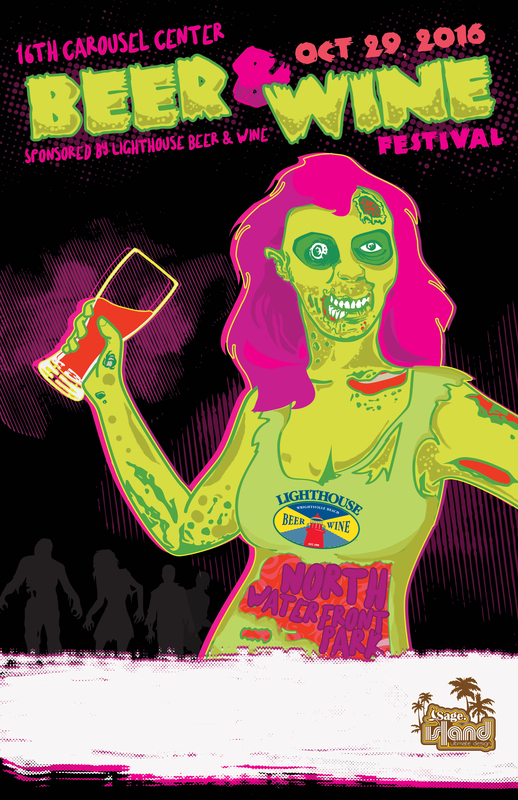 This year, Lighthouse Beer & Wine wanted a Halloween-themed poster to highlight the timing and light-hearted appeal of the festival. The team at Sage Island set to work at crafting a creative, fun poster that perfectly fit the theme Lighthouse was looking for. The 2016 poster certainly proves this! To fully highlight the style and theme of The Beer & Wine Festival, Stephen incorporated a beer sipping zombie to highlight the idea of Halloween and take advantage of the current zombie trend. The result is bright, eye-catching, and a little bit weird, and we couldn’t be happier with how it turned out. PS: If you want to attend this year’s festival, you’re in luck! Tickets are currently on sale and a portion of the proceeds go toward the Carousel Center. Drinking for a good cause—what could be better?